Turkey "strongly protests" the U.S. decision to sanction two of its ministers and calls on the country to reverse its "wrong decision," the foreign ministry said Wednesday in a statement. "The decision targeting two ministers does not comply with state solemnity and cannot be explained by the concepts of law and justice," the statement said. The U.S. Treasury on Wednesday issued sanctions against Turkish officials including Minister of Justice Abdülhamit Gül and Minister of Interior Süleyman Soylu in retaliation over Turkey's detainment of terror-linked U.S. pastor Andrew Brunson. The foreign ministry also said that U.S.' "aggressive attitude serves no purpose," adding that Turkey would respond in equal measure. 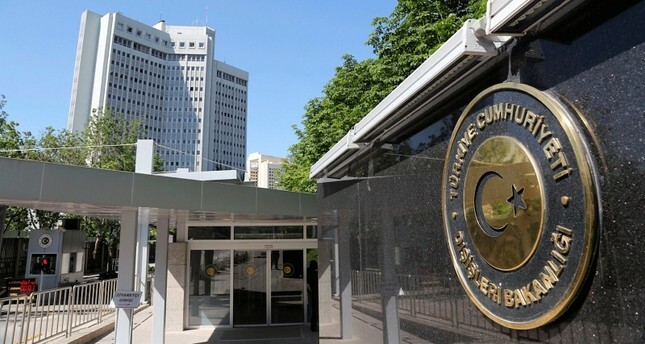 It underlined that the latest U.S. move could be considered a "disrespectful intervention" to Turkey's judicial system, saying that it will harm constructive efforts to solve problems between the two countries. Meanwhile, Foreign Minister Mevlüt Çavuşoğlu said on his official Twitter page that the U.S. sanctions move would not be left without retaliation. "We cannot resolve our problems as long as the U.S. does not give up on its unlawful demands," Çavuşoğlu added. Another official from the Turkish government reportedly told Habertürk daily the escalating tensions with the U.S. would be resolved through dialogue, yet the country was ready to retaliate to the sanctions if needed. "We are engaged in negotiations with our U.S. counterparts at the moment, which continue in a positive atmosphere. Both sides have reiterated their willingness to preserve good diplomatic relations," the official, who spoke on the condition of anonymity, said. Justice Minister Gül later said he does not own any property or have money outside Turkey, therefore attempts by the U.S. Treasury to "block" assets under U.S. jurisdiction will have no effect on him. Another sanctioned Turkish official Interior Minister Soylu also shrugged off Washington's move, saying the only business he has with the U.S. is the extradition of Gülenist Terror Group (FETÖ) leader Fetullah Gülen. Brunson, who was previously jailed for his links to the FETÖ and the PKK, was released on July 25 following an appeal by his lawyer, who objected his extended detention in an earlier hearing, citing health problems the 50-year-old defendant suffers from. The Second High Criminal Court in Izmir ordered his house arrest and a ban on travel abroad for the pastor. Brunson, a Christian pastor from North Carolina who has lived in Turkey for more than two decades, was indicted on charges of helping the FETÖ, which is responsible for the failed 2016 coup, as well as supporting the PKK terrorist organization. The case has been a thorny issue between Turkey and the U.S. Washington has repeatedly called for the release of Brunson, claiming he was "unjustly detained." The Turkish government has repeatedly told Washington that Brunson's case is being handled by the courts and the government cannot intervene.